In 2012, 2 days after Christmas we lost my funny and strong sister-in-law to this horrible disease and we have missed her every day since 12/27/12. 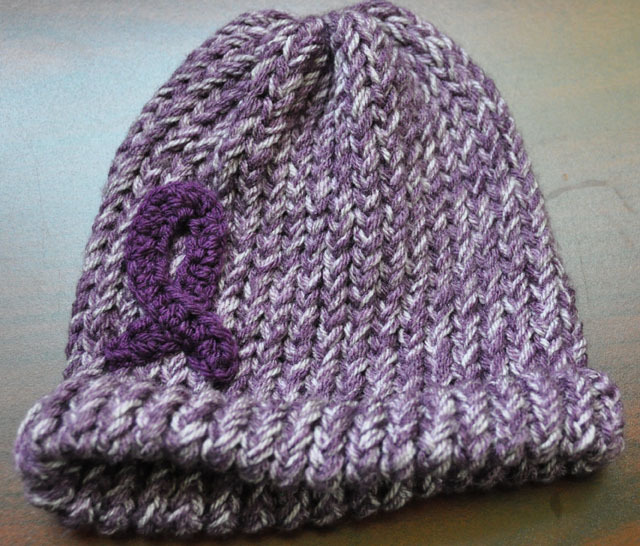 I made these hats in honor of Wanda and her brave fight with pancreatic cancer. 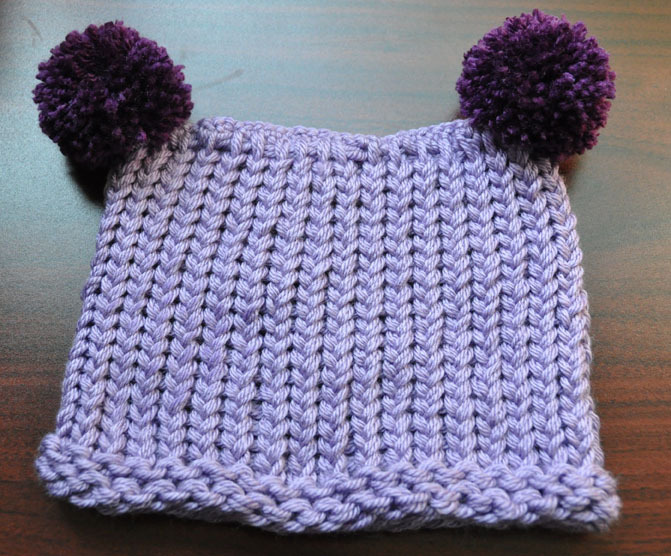 I hope to continue making purple hats all month long! I can’t believe how fast time flies… I am just taking down the Halloween decorations and it’s already the middle of November. Though I am well aware that November is Pancreatic Cancer Awareness Month, in the beginning of the month, I struggled with my words. 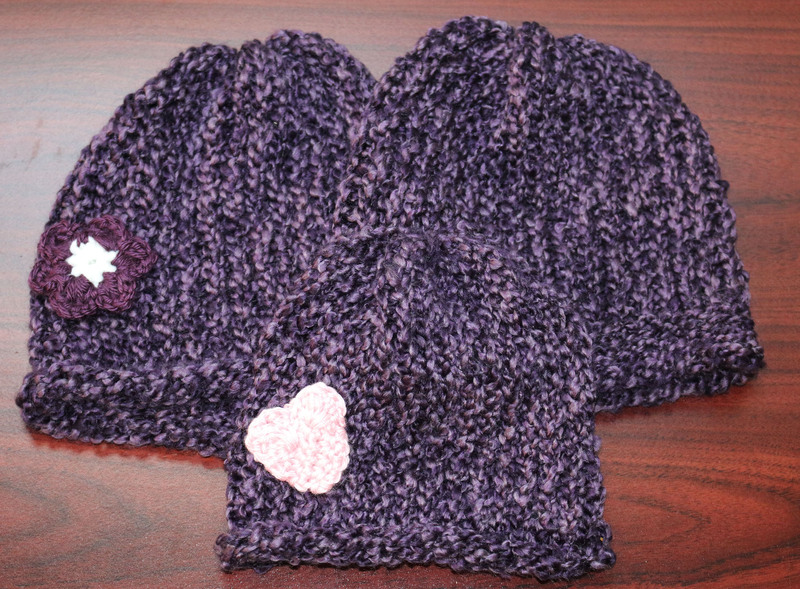 While my mind meditated in deep thought and my heart explored feelings, I made 3 hats in a dark, deep Homespun purple. Two of these hats are for adult cancer warriors, and the smaller one is for a little girl, someone who perhaps fancies purple. About 46,420 people (23,530 men and 22,890 women) will be diagnosed with pancreatic cancer. Rates of pancreatic cancer have been increasing slightly over the past decade or so. Pancreatic cancer accounts for about 3% of all cancers in the US, and accounts for about 7% of cancer deaths. The average lifetime risk of developing pancreatic cancer is about 1 in 67 (1.5%). In a Thanksgiving spirit, I am thankful that Wanda was in our lives for the little bit of time as her impact was large and long reaching. I remember many of the talks we had, especially about Knitting Rays of Hope. She was my inspiration for starting this effort, as together we would sit in the oncology centers and see the need for support, encouragement, hope and love in sometimes extremely bleak situations. … though I smile bravely and march on as she showed us all how to do, by her example. We just dropped off 10 adult hats to keep chemo warriors warm. Walking into the Kaiser Permanente Oncology Center in Ontario without my sister-in-law can be difficult. I see the familiar faces of the nurses or staff and memories start to flood my mind. But, I have been taking my son, who is a great and constant distraction with all of his energy and curiosity, plus he provides a loving hand to hold. This delivery was a bit different, as the charge nurse personally accepted the hats and thanked us with a hug and kiss. She told us how much these hats mean to her patients. I recognized her, as she gave us an orientation and tour before my sister-in-law started her chemo there. However, without my sister-in-law, she didn’t seem to recognize me and I didn’t verbally respond to her. I could have told her who my sister-in-law was, or that I was continuing this in honor of her, or that I know personally how much these hats mean to chemo warriors. I just smiled, prayed that the tears wouldn’t fall out of my eyes and mumbled “Thank you”, holding my son’s hand as we walked out. I hope she understood that I just couldn’t speak with any composure, not yet. I ‘m only at the point of being able to walk into the building and take the elevator to the basement without having becoming an emotional wreck. But I go here, specifically for Wanda, my sister-in-law, whom I love and miss very much. This was created in honor of my sister-in-law, for her birthday (6/30) and for her courageous fight against this horrible disease! June is a particularly difficult month for my family now, but it used to be completely different. We used to slightly groan about how it felt like Christmas in June, and how expensive it was for us as a young couple. God created so many wonderful people in the month of June: my father-in-law, my mother-in-law, my daughter, my brother, my nephew and sister-in-law. We lost my mother-in-law to Lung Cancer in 2005, my father-in-law to ALS in 2009, and my sister-in-law to Pancreatic Cancer in 2012. Oh, how I wish my problem was figuring out what to get them for their birthday instead of missing each of them so much. Shortly, I will take this hat (and some others) to the adult oncology infusion center, where Wanda used to receive her chemotherapy. I hope that it will bring courage, inspiration and hope to a chemo warrior in their fight against pancreatic cancer! I made a purple envelope hat for 1 of our special requests, but I don’t think it’s big enough, so it’ll be included in our next children’s delivery of chemo caps. I will make another one, a little longer for the special request and include a little more detailed how-to guide in that post. Yesterday, we did a furniture swap and started going through a lot of my sister-in-law’s stuff. Death is so ugly, so final. Dealing with the business side of death is also so ugly, something no one wants to do but it has to be done. Unless you have done it, you really have no idea of what really needs to be done. All the nitty gritty details, all the drab business. Going through material possessions, fighting the tears, living the memories, making decisions, remembering and wishing for things that can’t be changed. It’s difficult without her- Wanda, my sister (-in-law). Everyone loved her, so many people. Me -I loved her and miss her everyday.